LURC Needs to Listen to the People! 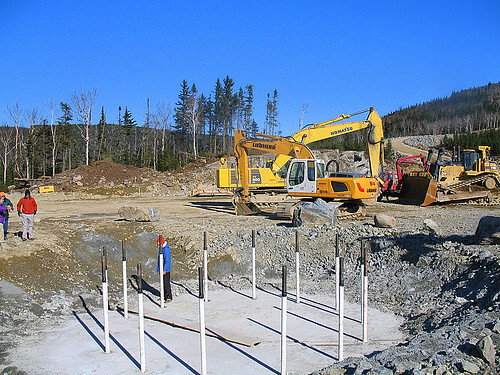 On Dec. 23, 2009 Maine’s Land Use Regulation Commission (LURC) announced that TransCanada Corp had submitted a complete application for yet another industrial-scale windpower project on Sisk Mountain. This 15 turbine project, which will require additional road building and transmission lines in a pristine, mountain-top environment, is being pushed through by LURC under Maine’s ill-conceived Expedited Wind Energy Law. The extreme public concern surrounding the development of Sisk Mountain for wind power is rooted in the area’s outstanding scenic value, wide range of recreational opportunities and sensitive, pristine habitat. In addition to scenic value and recreational opportunities this area is prized for its ecological significance– home to historic Golden eagle nesting grounds (protected under the Federal Bald and Golden Eagle Protection Act) and listed within critical habitat for the Canada Lynx (protected under the Federal Endangered Species Act). The TransCanada application fails to adequately address these concerns. We have only until Jan. 13 to convince LURC to hold a public hearing. This will only happen if LURC receives an overwhelming number of emails, letters, and phone calls from the general public requesting a hearing. Without a public hearing, this process is transformed into a one-sided, biased; backroom deal in favor of TransCanada and the public be damned. Without a public hearing, the public is deprived of a fair, open, and unbiased process. Without a public hearing, the general public and stakeholders such as FBM are faced with an unfair limitation in getting our views in front of the Commissioners. A public hearing is the only means by which our legitimate concerns can be heard. Without a public hearing, the process is unfair and arbitrary.TransCanada has the resources and ability to do extensive public outreach to convince an unsuspecting public of the merits of their position; grassroots groups like Friends of the Boundary Mountains need to have public hearings to create a level playing field; otherwise a flawed and totally unbalanced, undemocratic process. The volunteers at Friends of The Boundary Mountains are pleased that you are visiting our site. Welcome! We hope you find it informative and enjoy the photos. Moreover, we hope that you will join us in supporting the protection of the Boundary Mountains in Maine, one of the last regions whose sky is unpolluted by man-made lighting; a “dark sky”, and home to several threatened species (not including the moose to the right, although he is very handsome and we had to include him). Moose aside: we are confronted by the well-financed and politically-savvy efforts of the multi-national TransCanada Pipeline Corporation to devastate the ridges, valleys. and streams of the wild Boundary Mountains in order to install massive industrial wind turbines, miles of paved roads, and wide power transmission line corridors. 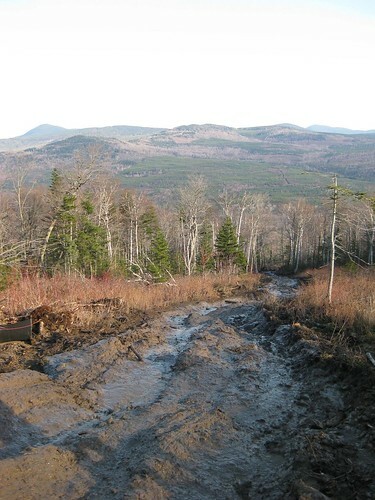 TransCanada seeks to turn the Boundary Mountains of Maine into its own industrial wind colony for the huge tax benefits provided by the U.S. government and to greenwash the pollution and carbon emissions of its pipeline operations all over the world, as well as to cover-up its cultural genocide of the Lubicon Cree peoples in Alberta, Canada. Traveling around rural Franklin County and the halls of Augusta with bags of money and an army of attorneys, PR flaks, and consultants, TransCanada has the political and media establishment eating out of the palm of its hand. In Oct. 2008 a 900 foot mud slide caused by TransCanada's construction project washes down Kibby in the Boundary Mountains, towards mountain streams in the valley below. For 34 years mountaintops in Maine above 2700 feet have been classified as mountain protected zones (P-MA), where only minimal disturbances were allowed. In 2008 Maine’s Land Use Regulation Commission (LURC), at the behest of TransCanada, re-zoned Kibby Mt., one of the premier mountains in Maine, to be a Planned Development District to accommodate a 132 megawatt industrial windpower operation. When Governor John Baldacci formed a Windpower Task Force to recommend appropriate ”expedited” areas for siting windpower, TransCanada’s chief attorney and an energy industry lobbyist were both invited to join the Task Force, while representatives of Friends of the Boundary Mountains and other wind opposition groups were denied. Maine’s largest so-called “environmental” groups were offered, and have accepted, a “mitigation” payment from TransCanada in return for supporting TransCanada’s proposal for re-zoning and throwing Kibby Mt. under the bus. This then is the political landscape upon which we are resisting turning the Boundary Mountains into an industrial wasteland for the benefit of corporate greed. Windpower in the Boundary Mountains is not about mitigating global warming and contributing to a healthier planet. No coal plant or other polluting source will be closed due to TransCanada’s operations in the Boundary Mountains nor does Maine need the electrical power. Its all about production tax credits, accelerated depreciation, and TIFs for TransCanada, a “see-how-I-care” image for Baldacci and other Augusta politicians, and a feel-good mirage for the media and those living to the south of the mountains who will be relieved of taking personal responsibility for a planet destroying lifestyle by just “putting it in the mountains”, out-of-sight and out-of-mind. Help us protect the Boundary Mountains. Become a member, stay informed, be an activist, and share your interest with everyone you know who loves this place like we do. If not stopped, the harm to truly one of the last natural frontiers in the northeastern United States will be irreparable. The Governor’s Task Force on Wind Power, comprised of industry representatives, false environmental NGOs (while grassroots community based organizations were denied participation) legislators, and energy industry lobbyists, examined how to assist Maine’s wind industry and reduce barriers to the expansion of this industry. The Task Force rushed through an Emergency bill, the “Expedited Wind Energy Law,” that passed the legislature in 15 days with virtually no discussion or debate, in April 2008. This law places a huge part of the State within an expedited area for wind power development and allows for two agencies– Land Use Regulation Commission (LURC) and the Department of Environmental Protection (DEP) – to increase the expedited wind power area at the industry’s request. Currently, LURC is faced with an application from TransCanada Corporation to increase the expedited area to include all of Sisk Mountain overlooking remote, historic, scenic, and ecologically sensitive Chain of Ponds. LURC is clearly not qualified to make such a decision, and, in realizing this, they are holding a public hearing to create the criteria with which they will make final decisions concerning the expansion of the Sisk Mountain expedited area and all future expansion requests that come before it. Friends of the Boundary Mountains is asking for the public to take a stance against this undemocratic, unconstitutional law that is threatening, Maine’s mountains, our local communities and our unique way of life! When: Wednesday; December 16th 2009 beginning with a panel of the Governors Task Force participants at 9am followed by public comment beginning at 11: 30 and continuing into the afternoon, with a break for lunch from 12:30-1:30.
Who: Any and all who are concerned about our mountains and our energy supply! What: LURC will be taking testimony on the expansion of the expedited areas for wind power development. ***We encourage everyone to testify in person at the public hearing; however, if you are unable to attend please submit written testimony to LURC via email at lurc@maine.gov (include in subject line “TransCanada”) for consideration by the Commission. It’s Not Hard to Be Part of Something So Important!! The Friends of the Boundary Mountains recognize that we have no time to spare to save the mountains. And the Boundary Mountains are not only ours to save, but belong to our mother Earth, who now has less and less pure night’s dark sky, and natural habitat, left to protect. We understand that the Boundary Mountains, and the flora and fauna who live here, are finite resources, and we will abide by our commitment to save this “corner ” of the planet for the good of all her inhabitants.